I love paper planners, I think they are an important key in structuring your day and time to set yourself up for success. I know there are other electronic options but I just don’t feel, for me, that they are as successful in creating order as a paper planner. I know they are a personal preference and many other reasons why planners, no matter the format, make our lives easier. They help to organize our lives and give us ways to store this information which is easily lost or forgotten about, but in my opinion paper planners do a better job and here are my reasons why! Paper planners are just fantastic and you are not limited in your options which are great, as planners are a personal preference and this means a lot of variety to achieve the best planner to meet your needs. The art of writing things down, taking notes, reinforces those words into your mind, not only do you remember the topic or the commitment better, but you have a physical reminder of the task to do. Writing itself is an important skill which many people don’t practice on a daily basis. Are you ashamed of your handwriting? Without practicing every day, you are not going to see any improvement in this area. Writing a physical planner helps to reinforce this skill and gives you the space to practice important skills. It’s a physical item, it is not part of your phone or computer and this is something you touch and use to create and organize your day. Yes, a phone is physical, but it has more than just the ability to hold information for planning, it also has access to social media and other distractions, your planning needs separation from distraction and you only get that with a physical planner you can hold. A paper planner is a personal item, it contains important information that helps you determine your actions. You can transform this into something that represents you. With the different styles and types of planners, you will find something that will suit your needs and fit your style. There are free options that you can download from the internet and then print out, you can buy a ready-made planner, or you can create your own, something that meets your needs, helps you to tackle your daily tasks and can help in steering you towards completing your goals and moving towards your dreams. A paper planner can become more than just a planner, it can store so much information, it means you don’t have to worry or fret that you have forgotten to do something because you teach yourself to write everything down. You have a place to make notes on things you don’t want to forget, you have space to write down appointments and any task that you need to tackle. It becomes a mind dump, it can allow you to not worry about missing appointments because you have them written down. You aren’t restricted with the constant need for power for your mobile device if this runs out of power you are unable to check your planner as to your next task or activity. Paper planners are as simple or as complicated as you want to make them, you don’t have that choice or freedom with an electronic planner. You’re restricted by the programming, with a paper planner you don’t get that issue, you find a planner that is suitable for your needs and if in the future your needs change it is simple to change to a new planner or to adjust how you are using your current planner. The advantage of the modern world is the ability to produce the right equipment that meets the needs of an individual and that is just as important with a paper planner. The advantage over a paper planner is your ability to find one that suits your needs and desires and as these change, so too, can your planners. There are a number of different types of planners available to buy ready-made or to purchase or download free options from a number of different sources on the internet. I don’t take my planner out, it stays on my desk and it is a large planner, but this is because I work from home; in the past my planner was of a more manageable, movable size. I have never been one for finding exactly what I need and I tend to stick to the ARC system for holding my planning pages and if I need to add something into the mix I can do this very easily. Knowing what you intend to do with your planner can help develop some key areas as to what you need and want when it comes to planning. If you intend to carry it around with you, then thinking about the size and weight of the planner is an important aspect that you must take into consideration. If you are looking for noting down meetings and other activities having a timed planner might be something you need to consider. Even, knowing if you want a weekly or daily spread, will help to narrow down your search options for your perfect paper planner. 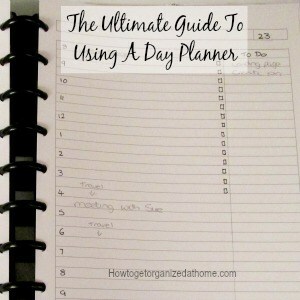 I wrote an article on, The Ultimate Guide To Using A Day Planner, I think you will love this article too! I hope I have convinced you to give a paper planner a chance to inspire you, for me they are able to give me focus and purpose and a place to remember the tasks that I need to do. It allows me to organize my time and to get all the things that I need to do, done during the day. I think they are an important part of reaching your goals and a great way to remember the details, to sort through those thoughts and feelings which can sometimes distract our thoughts and actions, thereby helping us to stay focused on the tasks, plans and actions that we need to take to get through our hectic and busy schedules which become part of everyday life. Do you love paper planners the best? If you are looking for other articles on this topic head over to the landing page where you will find links to other articles on planners and planning.